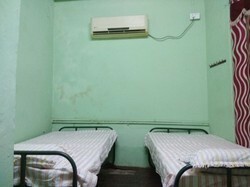 This is an individual air conditioned room with attached wash room and double bed. The room has a Television, telephone and wardrobe. Simha Board Room is located in the basement of Hotel Abi Krishnaa. This executive board room is mainly used by the corporate to conduct business meetings and conferences. It holds an accommodation up to 25 persons in capacity. Alps Residency consists of 16 high-end homes with refined decoration, both modern and exotic. Each apartment has a separate kitchen, a large air-conditioned room and a spacious and functional living room (with dining area and lounge area). The Multipurpose A/c hall accommodates 200 pax capacity and it is located in Third floor having access by stairs and lifts. A huge attraction in Pondicherry, 3 meter high statue of Dupleix, built to honour Francois Dupleix, who governed Pondicherry till 1754. This was commissioned in 1870. It is constructed over beautiful costly granite columns at the Place du Republique. Suite type separate living and a bed room, private sit outs, very spacious well furnished occupancy suits families, couples etc for a memorable stay. Air conditioned, free internets, lcd tvs, big bathroom, kettle etc. Cold Face Fresh Towel On Request At Entry. Villa Indra provides 3 cozy bed rooms with air conditions and attached bath with hot water all through the day. Rooms are made comfortable with special soft mattress and decorated with a modern European sensibility and an Indian touch. Conditions Only 2 persons per room and extra bed will not be provided. The 03 King suite rooms are quite spacious with king size bed & a well furnished sitting area in the same room. These rooms are normally preferred by family guest & couples. Room Amenities like Mineral water, Cookies, Soft Drinks & Fruit basket refilled on daily basis.